Habiba Suleiman, 29, has been a district malaria surveillance officer for two years. Here, she leaves her home to head to Shakani village as a part of her work for the USAID-supported Zanzibar Malaria Elimination Program. 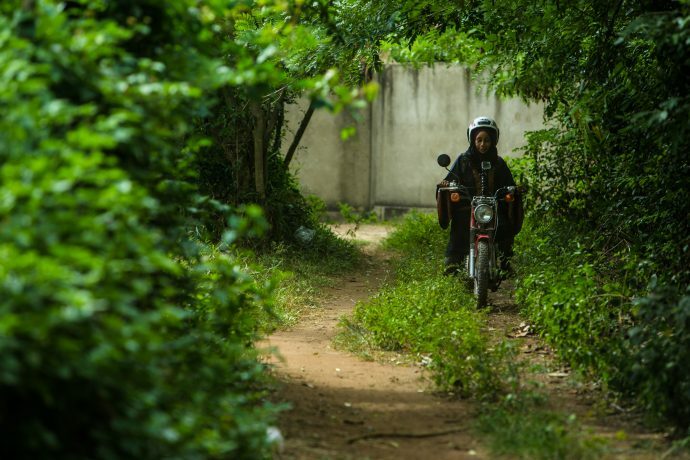 Using a tablet, phone and motorcycle provided by the program, she is able to quickly respond to cases of malaria, test family members and neighbors, and record this information on a surveillance system. Her work in preventing and treating malaria is helping eradicate the disease from the island. After nearly nine months of work, hundreds of consultations, and more spreadsheets than you can imagine, USAID has unveiled one of the key pieces of the journey to self-reliance, a cornerstone of USAID’s Transformation effort: the self-reliance metrics. At its core, the journey to self-reliance is about how we can best realize our overarching goal as an Agency: ending the need for foreign assistance. To do this, we need to bring a strong, country-focused approach to how we “do” development. We need to be able to assess each of our partner countries’ individual abilities to plan, finance and implement solutions to solve their own development challenges—what we call “self-reliance”—and re-orient our partnerships accordingly. Whether countries are emerging from conflict, or experiencing steady development progress, our goal should always be the same: building self-reliance in each of our partner countries. Eugene Jasmin, in pink shirt, 39, and his employees work on furniture at Eugene’s carpentry workshop. 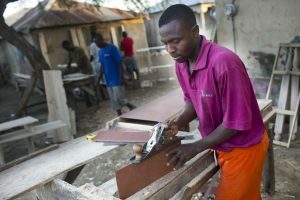 Their lives have all changed thanks to a power plant that USAID helped build in their northern region of Haiti. Well, for starters, we know that self-reliance is a journey—for some, that journey will not be too long; for others, it may take decades. And these journeys are complex—they are rarely linear, nor are they determined by just one thing. Our roadmaps will use 17 high-level, third-party metrics to paint the picture of a country’s position on its overall journey to self-reliance. Seven “commitment” indicators measure the range of policy choices, actions and behaviors that enable a country to drive its own development journey, and 10 “capacity” measures tell us how far along the development spectrum a country has come. Together, these two groups of metrics indicate how close or far a country is from strong self-reliance overall. When we look at the metrics individually, we can see how close or far the country is on each particular issue that underpins a country’s ability to be self-reliant. This, in turn, will help shed light on where a country’s strengths and weaknesses are when it comes to self-reliance, and where to potentially focus and/or re-orient our partnerships. It’s important to note that no map is perfect—sometimes it’s out of date, or doesn’t show you enough detail to actually make it to your final destination. Our roadmaps and metrics won’t be perfect either. This is why they are meant to be a starting point: a way to begin not only understanding our partner countries’ respective journeys to self-reliance, but also where, at a high-level, we need to take a closer look. As a result, we will continually update and improve our roadmaps over time. It is also important to understand that these roadmaps and metrics will simply be one element—albeit an important one—as we begin to reorient ourselves towards self-reliance. By early fall, we plan to have Self-Reliance Country Roadmaps available for almost every low- and middle-income country. At the outset, this new, broader self-reliance approach is being tested with a handful of countries. And the new USAID Policy Framework we anticipate releasing in the fall will establish self-reliance as central to our Agency’s overall policy approach. So there’s a lot going on! Stay tuned as our journey evolves over the coming year—we look forward to engaging with you on this exciting new approach. To learn more about these metrics, I encourage you to visit our Self-Reliance Metrics webpage. Chris Maloney is a Senior Advisor in the Bureau for Policy, Planning and Learning and Deputy Coordinator of the Agency’s Transformation Task Team. Missed the launch event? Watch it here.